Cup Characteristics: Fruity character with slight hints of berry, bring depth and character to this delicious tea. 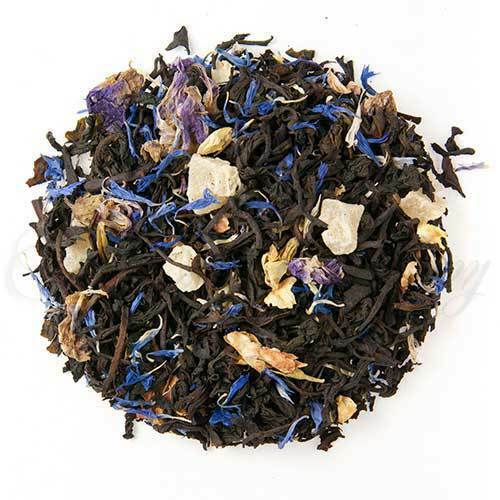 Luxury Ingredients: Black tea, Pineapple pieces, Cornflower & Jasmine & Mallow petals, and Natural flavors. So goes a poem by the ancient Chinese philosopher Confucius. The Chinese were the first to cultivate the smallish purple-blue fruit, and revered it as a symbol of love and good fortune. Interestingly, this reverence for the common plum is not just limited to ancient China. In the United States, the fruit has its own holiday, National Plum Pudding day on February 12th. Across the Pacific in Japan, the whole month of February is dedicated to the fruit since it blossoms during that month every year. In many parts of Europe wild plum trees grow in great quantities and living near a grove of them is thought to increase fertility, and virility!